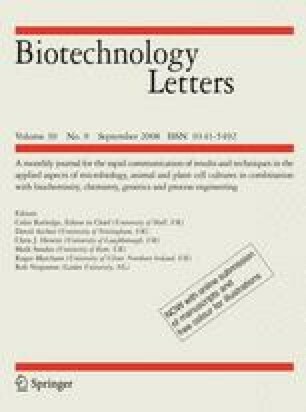 Recently we have described the design and operation of a miniature bioreactor system in which 4–16 fermentations can be performed (Gill et al., Biochem Eng J 39:164–176, 2008). Here we report on the use of thermal profiling techniques for parallel on-line monitoring of cell growth in these bioreactors based on the natural heat generated by microbial culture. Results show that the integrated heat profile during E. coli TOP10 pQR239 fermentations followed the same pattern as off-line optical density (OD) measurements. The maximum specific growth rates calculated from off-line OD and on-line thermal profiling data were in good agreement, at 0.66 ± 0.04 and 0.69 ± 0.05 h−1 respectively. The combination of a parallel miniature bioreactor system with a non-invasive on-line technique for estimation of culture kinetic parameters provides a valuable approach for the rapid optimisation of microbial fermentation processes. The authors would like to thank the UK Joint Infrastructure Fund (JIF), the Science Research Investment Fund (SRIF) and the Gatsby Charitable Foundation for funds to establish the UCL Centre for Micro Biochemical Engineering. Financial support from the UK Engineering and Physical Sciences Research Council (EPSRC) and Bioxplore, in the form of an Engineering Doctorate (EngD) studentship for NKG, is also acknowledged.